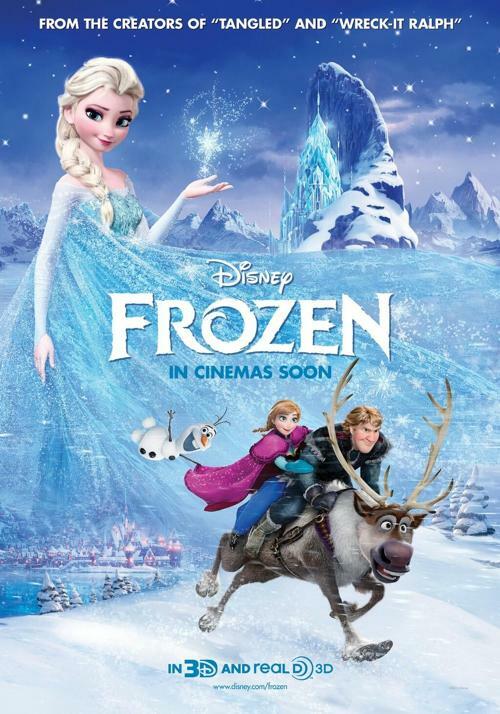 Have We Frozen Children’s Movies? Hubby and I used to go to the movies a lot. I love seeing films on the big screen, right at the same time as everyone else is seeing them for the first time. However, let’s be honest: once you have a kid, that’s a REALLY expensive date night. Movie tickets aren’t cheap, and neither are babysitters. Once you tack on dinner before the movie or drinks after, you’ve spent a lot of money. So needless to say, since EK has been around (about 27 months), we’ve seen a total of less than 10 movies… maybe even closer to 5. That being said, we didn’t see Frozen until several months after it came out on DVD. I had heard all the hype, had students who were obsessed with the movie, characters, and soundtrack. Because I have loved Idina Menzel since “Rent”, I managed to hold off listening to the song until I watched it in the movie the first time. It’s a great song, she sings it SO WELL, and it was almost unbelievable how quickly my daughter heard the first notes of it, stared open mouthed at the tv, and begged for me to play it again as soon as it was over. I mean, seriously? She had never heard it, didn’t know that it was the song that everyone was supposed to love. It was just that great. I think someone tipped her off. I have long been a fan of Disney. Nay, a obsessive lover of all things Disney. That about covers it. I love the movies, the shorts, the music, the characters, the voices, the animators, the world created for and devoted to Disney. The first movie I ever saw in a theater was Disney’s The Little Mermaid. The next movie I remember seeing in theaters was Disney’s Beauty and the Beast. Every summer for as long as I can remember, my mom would take my brother and me to the newest Disney flick at least once, maybe twice in the theater, and we would get the VHS (yeah, I said it) for Christmas. Like clockwork… it was our tradition. Now that I’m the mom, the “grown up”, I’m watching these animated features with a little more scrutiny. I still love them, oh yes, but I’m looking for more than a catchy tune and a happy ending. Pixar added incredible things to the latest movies, not the least of which were new ideas and 3-D animation. Whether or not the movies were complete musicals has gone in and out over time, as has using original stories versus tried and true tales. I will say one thing: every time I see a new one, I’m amazed at how the integrity of the movies I’ve loved since childhood has been upheld, in quality and in magic. Two of my newest favorites are Frozen (I love it almost as much as my daughter) and Brave. On the heels of my #LikeaGirl rant (read it here), I love them for their heroines. Brave‘s Merida is the epitome of who I was as a preteen: outspoken, strong character, always right, forever at odds with her mother, and yes, a bit awkward. I relate to her immediately, as I’m sure thousands of girls did during their first viewing of the movie. My favorite thing about the storyline? Redemption of relationship and no romantic love interest in sight (quite the opposite, in fact). Brave is about Merida and her journey, so no man needed. Talk about empowering girls! Look at this gal, she might have made some mistakes, but she worked to make them right again, and here she is, a total rockstar. She even makes me want to grow out my hair, get a perm, and dye it red. Maybe I’m reading too much into it. I mean, I don’t remember having any thoughts about the movies past “I love that song “Part of Your World” and “Lumiere was really funny!” and “I can’t believe Pegasus acted like a bird the entire movie.” I never had a thought about Ariel disobeying her dad just to get with a guy, paying for it, and then having to have her dad bail her out anyway. Or how selfish Woody is in all those Toy Story movies, trying to selfishly keep Andy for himself. I just enjoyed them for what they’re worth… and they’re GREAT films. Truly. But some of the early movies, like Snow White, Cinderella and Sleeping Beauty, don’t really give the image of their heroines doing anything much at all mostly just cleaning, yet I can still safely say that Sleeping Beauty is one of my all-time favorites. How does that work out? Honestly I’m not sure. It just is. Am I overthinking it? What do you think about the leading ladies of Frozen and Brave?